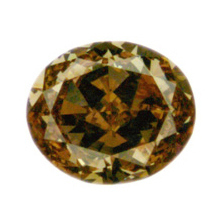 The Oval Fancy Brown Orange Diamond is just perfect with very good polish, good symmetry, VS1 clarity, and a full 1.09-carat. The colors brown and orange add that twinkle and shine that you want from a diamond. Every time you glance, you will see an amazing sparkle.